The Certified Specialist of Wine (CSW) course tests a candidate's wine knowledge and mastery of key elements within the worlds of viticulture and wine production. 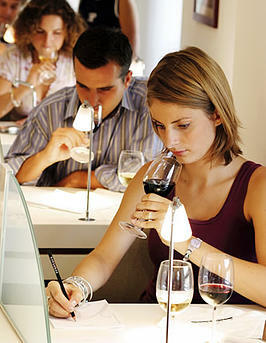 This certification is widely recognized and regarded by the international wine and spirits industry. Successful candidates earn the CSW title and use of the "CSW" post-nominal. This course will prepare you for the CSW exam. Currently, CSW courses and certification are only offered in an on-campus format at Wine Education Institute's Denver campus. Computer-based exams are proctored through a Pearson VUE Professional Center and are scheduled separately by each student. Currently, CSW courses and certifcation are only offered in an on-campus format at Wine Education Institute's Denver campus. Computer-based exams are proctored through a Pearson VUE Professional Center and are scheduled seperately by each student. This course is ideal for industry trade members with one to two years experience or graduates of equivalent wine programs. Please note that students will have a year to schedule their exams after initial registration. This course is designed to complement your own studies, this is a tough exam that we could easily structure into a 6 month class! To keep it affordable and as effective as possible, we use class time to review material and bring instructors have recently passed the exam to give you as much insight as possible. Classes are offered a couple times a year.